It doesn’t matter if you are writing your CNA exam, in school to become a registered nurse, or an LPN because this profession is very demanding. Current nurses have said that nursing school is one of the most difficult times in their lives because of the demand put on them during training. Think about it, you’ll be overseeing the treatment of ill people so you need to make sure you know what you’re doing. For example, some of the duties of a nurse include tracking data, answering questions, administering medications, and helping with daily living tasks like grooming, bathing, and eating. Not to mention, you oversee the recovery of patients after treatment, and comfort family members too. It’s important to mention that the intensity of your duties depends on the type of nursing program you’ve completed, but either way you’ll be overseeing patient recovery which is very stressful. Some people have waited years to get into a solid nursing program so it’s important you have a good set of study and time management skills. If you don’t, then you’ll have a hard time passing your examination and landing the right job. 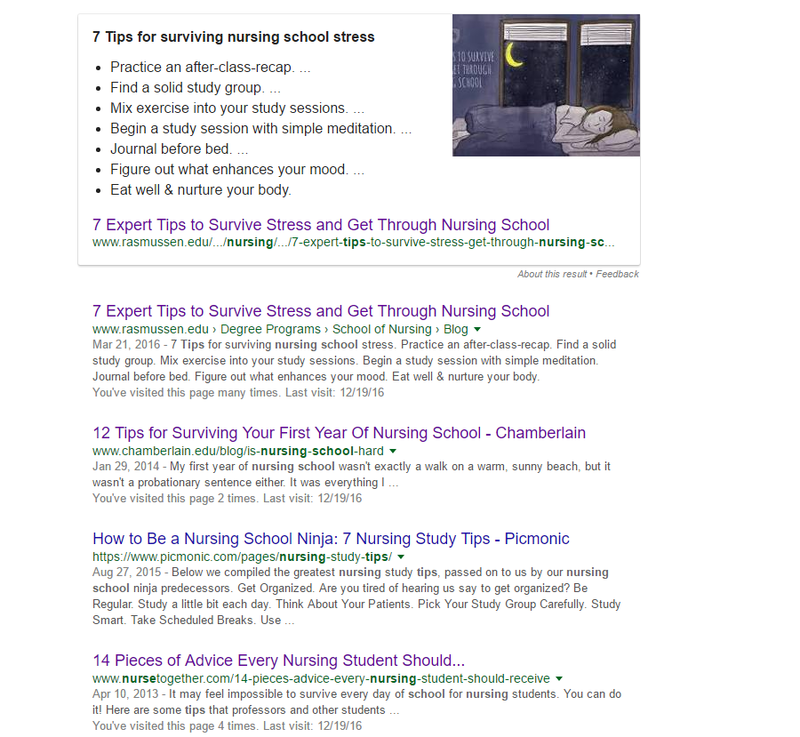 We’ve decided to do some research and put together the top 20 nursing tips to survive nursing school. Keep in mind that If you are becoming a CNA (certified nursing assistant), you don’t need to apply to nursing school. However, 75% of people who have successfully passed their CNA have done so to gain experience so they’ll know what to expect when transitioning to become a registered nurse. To become a registered nurse, you’ll have to apply to nursing school and these tips will come in handy. Overall, I believe these tips can be used to prepare you for any type of career, so it’s a good idea for you to read through them and take notes. Let’s get started and please leave your feedback and/or thoughts in the comment box. That’s right! No matter what career path you choose, it’s important to do your own research. This is even more important now since you have so many options available to you. However, this task has become easier because of the internet and the amount of resources available online. If you plan on applying to a nursing program, it’s important to research what’s required, how much it’ll cost, how much time you have, and what previous experience you need. For example, did you know many people choose to become certified nursing assistants before applying to nursing school? The experience helps them understand what’s required in a hospital environment and this builds a certain level of familiarity and comfort. It’s also important to note that different STATES might have different requirements so do your research to make sure you know what’s EXACTLY needed before applying. I believe research is always the first step in surviving nursing school because it mentality prepares you for the challenge ahead. Make sure you read testimonials from other nurses, join forums to ask questions, and review study guides. The importance of sleep cannot be questioned, and medical researchers have written about the negative effects poor sleep has on your health. Lack of sleep weakens the immune system, causes impaired brain activity, and cognitive dysfunction. Make sure you are getting 6-8 hours of sleep so you’ll be able to function within a demanding environment. Lack of sleep will make it hard for you to understand how to perform sensitive duties and will create a communication barrier between you and your mentor. Never be afraid to ask questions because it’s important you perform your duties correctly. It’s better to ask questions and get it right than to mess up on the floor which can be detrimental especially when taking care of patients. Your teachers and mentors are there to answer your concerns, and you’re paying a lot of money to learn the material. As mentioned, in nursing, concepts and material build up on top of each other so not understanding one thing will cause a negative chain effect. The health industry is built on the foundation of helping people, so try to always be there for others. It doesn’t matter if it’s a patient, fellow nurse, family members, or doctors, your job is to help everyone. The more you help, the more others will help you and that’s one of the best ways to learn and get comfortable in your new role. Space out your work and lower the pressure on yourself by setting daily goals. This will help you stay on top of what’s important and what can be completed later. Statistically, when you prioritize and complete important tasks, it can take some pressure off, which will help you perform better in the work environment later. Not to mention, every small task completed each day will serve as motivation. Don’t make groups too big because this eliminates the personal experience. Ideal size should be 3-4 people per group. Designate moderator to keep you on schedule. Decide topics you’re going to discuss before class. Discuss and quiz each other. Make these groups enjoyable and open for discussion. I discussed this slightly above and will reiterate it now because it’s important for you to survive nursing school. Don’t waste your brain power studying what’s not essential first. You should focus on the important time-consuming material while you have the energy. Studying for nursing can be overwhelming with some areas taking hours to comprehend. I recommend studying these areas first while you have the energy. If you are like me, you won’t have energy later in the evening when things start to slow down for you. The least important material normally doesn’t take much time and can be completed with little effort. The benefits of exercise and nutrition cannot be underestimated. It amazing how a regular exercise routine can elevate your mood and help with focus and motivation. Nursing school can be stressful and exercise has been proven to reduce anxiety, stress, and burnout. Exercise also increases your ability to retain information when you study which is great especially during nursing school. Take breaks with a study partner so you can go over notes while jogging or walking. Nothing will give you a harder time in nursing school than a lack of confidence. For you to successfully complete nursing school, you first need to know you can do it. Having the confidence will keep you pushing forward, and force you to never give up when things get tough. It’ll keep your mood elevated, help with focus, and motivate you to finish. If you’re NOT confident about nursing school, then you are in the wrong profession. One of the best ways to stay committed is by focusing on the reason you pursued nursing. Maybe it’s because you want to help people, or you went through a life-changing experience. As mentioned, nursing can be very tough and sometimes you’ll want to quit, but think about your purpose and why you got involved in the first place. During the clinical phase, you’ll be put in a nursing environment where you’ll interact with patients, nurses and even doctors. Afterward, you’ll be tested on what you learned which is usually the final examination before completing school. Without passing this part of the process, you won’t graduate so this should NOT be missed. The only way to survive and pass nursing school is to make sure you pass the clinical part. These are all great places to find not only what to expect in nursing school but in clinicals as well. These communities consist of future and current students, and even established nurses. It’s a real-time question-and-answer session that provides enormous value. Sometimes, writing down your thoughts is a great way to understand what’s holding you back. Nursing blogs are nothing new, and I’ve written a post on the Top 25 Nursing Blogs for Future Nurses. These blogs have personal stories, trending news, guest posts, communities, and jobs. If you want to survive the demands of nursing school, then starting a personal diary or blog is a great way to vent. It’s a great way to examine your own thoughts, and help others at the same time. If you are in nursing school, then follow the guide provided by your professor. It’s a great way to get a head start and find additional resources before you get to that section in class. There will be times you’ll be idle so seek out some volunteer work if possible. Finding relevant volunteer work will give you a better idea of what to expect, and make you comfortable in a nursing environment. You will have no problem finding opportunities since MOST hospitals are looking for motivated people to help. Visit local hospitals or even search online for some available in your area. The purpose of this unpaid placement is to build comfort and confidence for when you complete your nursing education and are put in a demanding environment for real.